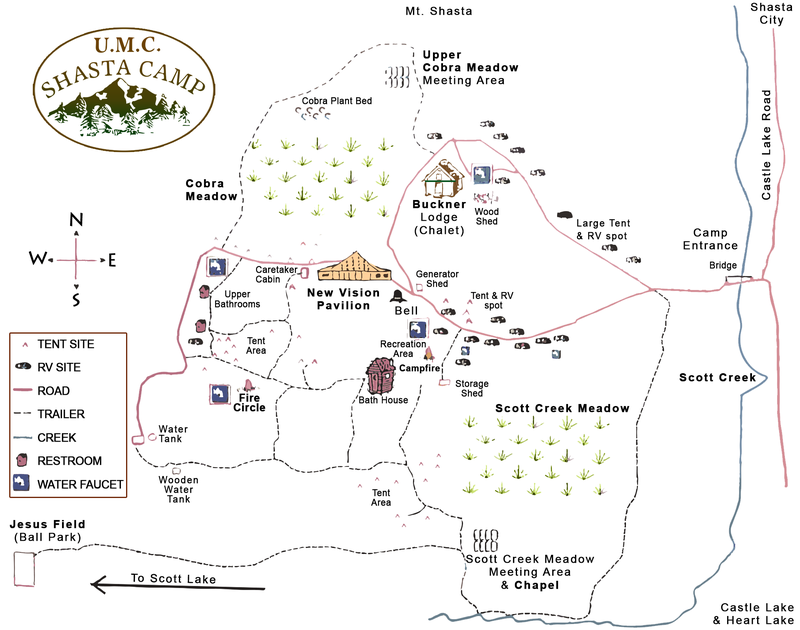 Shasta Camp is a Methodist campground a few miles off of Interstate 5. The campground is near the city of Mt. Shasta, California, which is along I-5, north of Dunsmuir and south of Weed. Mt. 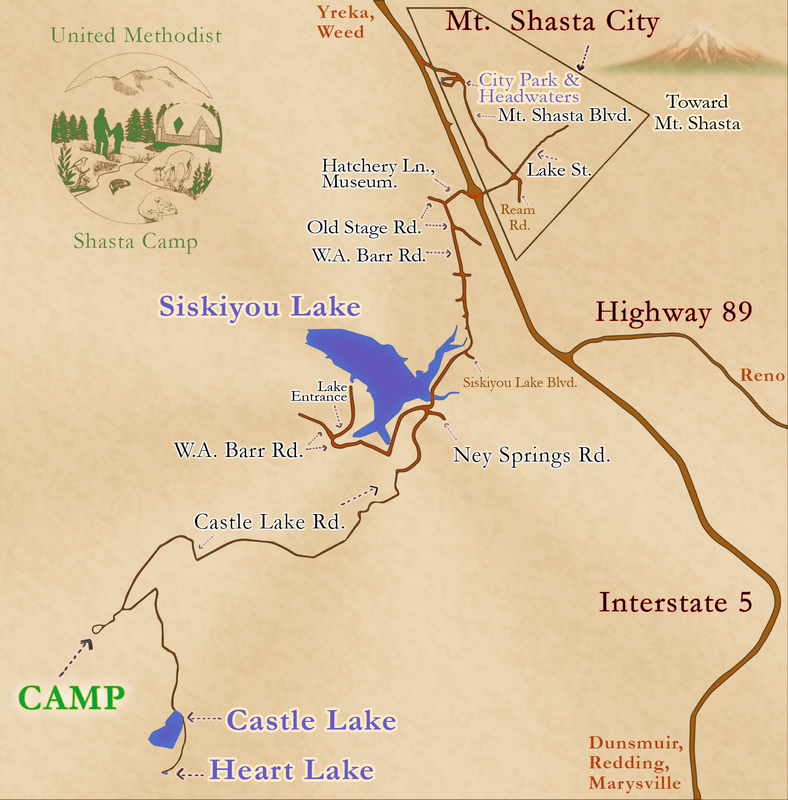 Shasta is on one side of I-5, and the campground is on the other side. The address is 8339, Castle Lake Rd, Mt Shasta, CA 96067. Click on an image to zoom in. Scroll down for a Google Map. If you are driving northbound on I-5, take exit 738 toward Central Mt Shasta, turn left to stay on W. Lake St., which becomes Hatchery Ln.. Turn left on S. Old Stage Rd., then turn right to stay on W.A. Barr Road. After a couple miles, take a sharp left onto Ney Springs Rd (which turns right to become Castle Lake Rd). 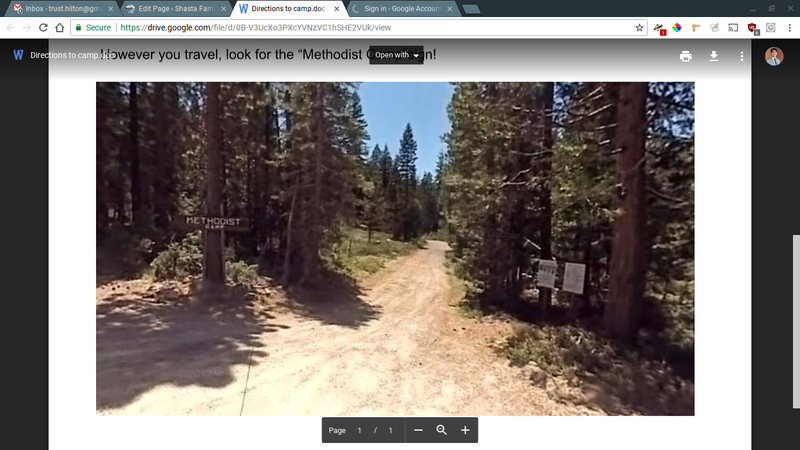 Follow this road for about five miles, and you will see the “Methodist Camp” sign. Follow the sign into camp. If you are driving southbound on I-5, the directions are exactly the same, except instead of turning left onto W. Lake Street after taking exit 738, you turn right onto W. Lake Street after taking exit 738. 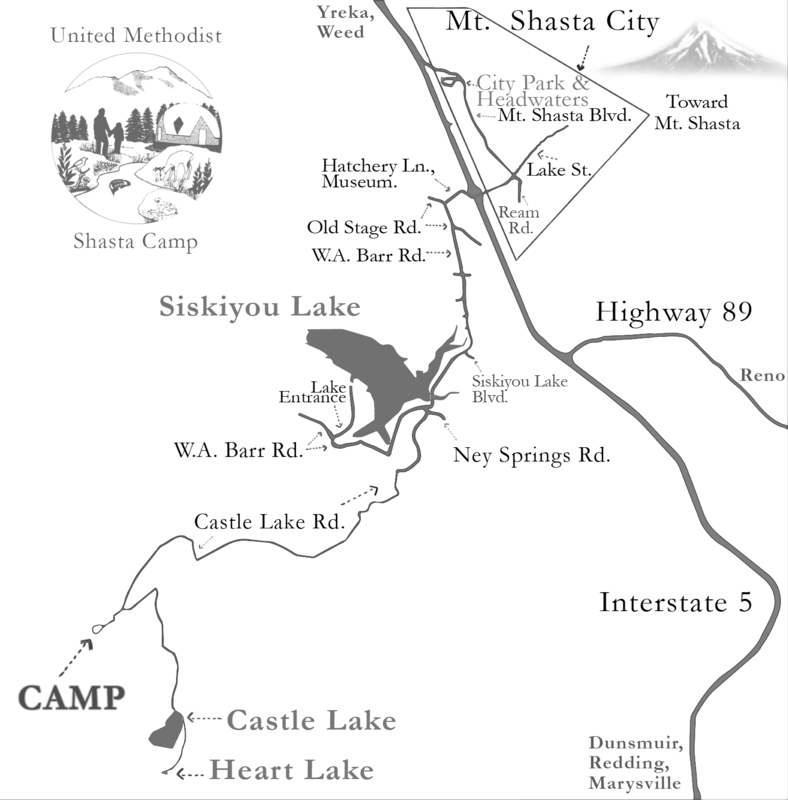 To leave Shasta Camp, turn left on Castle Lake Road, and follow it down to Ney Springs Road. Turn left on Ney Springs Road, then right onto W.A. Barr Road. Follow W.A. Barr Road until it ends at Old Stage Road. Turn left onto Old Stage Road, and quickly turn right onto Hatchery Lane. Hatchery Lane becomes W. Lake Street. Follow the signs to Interstate 5, or stay on Lake Street to drive into the City of Mt. Shasta.